1. Not all cells move through the _____________________________ at the same rate. 2. Experiments show that the controls on cell ______________ and cell __________ can be turned on and off. 3. Tim Hunt and Mark Kirschner discovered that cells in mitosis contained a protein that when injected into a nondividing cell, would cause a _______________________ spindle to form. 4. ___________________________ regulate the timing of the cell cycle in eukaryotic cells. 5. There are ______________ types of regulatory proteins. 6. ___________________________ allow the cell cycle to proceed only when certain process have happened inside the cell. 7. 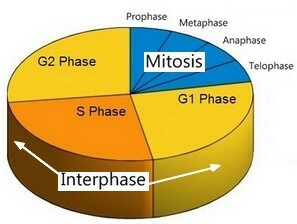 External regulators direct cells to _______________ up or ______________ down the cell cycle. 8. Growth ___________________ are among the most important external regulators. 9. Molecules found on the surfaces of _______________ cells often have an opposite effect, causing cells to slow down or stop their cell cycles. 10. ____________ is a disorder in which some of the body's own cells lose the ability to control growth. 11. Cancer cells do not ____________ to the signals that regulate the growth of most cells. 12. Masses of cancer cells form ____________ that can damage normal tissues. 14. An astonishing number of cancer cells have a ________________________ in a gene called p53. 15. Cancer is a disease of the _____________ ________________. 16. Stem cells are unspecialized cells that have the potential to ________________________. 17. Researchers have found that _______________ of stem cells can reverse the effects of brain injuries in mice. 18. Embryonic stem cell research is highly _______________. 19. For the word cancer, come up with a sentence or phrase for each letter that relates to the topic. This is not in your book, and you will need to be creative.